Wyoming has a growing need for individuals with college training. According to Complete College Wyoming, 65 percent of the jobs in Wyoming will require some form of college credential by 2020. In order to meet this demand, Wyoming has established numerous goals, including increasing completion at community colleges and developing new strategies to help college students stay in school. In order to help students find a college in Wyoming, we explored factors that matter to students, including tuition and financial aid availability, how much alumni make and the net price of colleges in Wyoming. We also put together a list of college planning resources and tools for prospective students to utilize. Compared to more highly populated states, Wyoming's higher education presence is smaller, but there are still plenty of great options for aspiring students. Those options are the focus of our rankings of best Wyoming colleges. We looked at the factors that matter most to students, such as tuition, future earning potential and student-to-faculty ratio. The rankings provide a great overview of the top Wyoming institutions. Prospective students who are interested in attending college might feel they are unable to go due to factors like financial constraints, lack of guidance or academic disadvantage. From scholarships to tuition to free college credits, Wyoming has several programs in place to help high school and other aspiring students overcome these issues and attend college. Below are a few of those programs. This program provides high school students with the opportunity to take classes that offer college credit. However, what makes this program particularly enticing is these classes are taken while students are still in high school, free of charge. Courses cover vocational and career subjects as well as basic academics that can transfer to another college or university. All of Wyoming's community colleges offer Dual and Concurrent Enrollment courses to high school students. The Gain Early Awareness and Readiness for Undergraduate Programs (GEAR UP) serves at least 2,000 low-income students who are at risk of not graduating high school. In order to improve the outlook for these at-risk students, GEAR UP uses a three-pronged approach. First, academic studies are improved. Second, academic expectations are raised so students will work harder to achieve more in school. Finally, GEAR UP educates students about their options to get into college as well as their potential in getting a college degree or credential. The Hathaway Scholarship is a series of five scholarships intended to help Wyoming high school students attend the University of Wyoming or one of the state's seven community colleges. The scholarship consists of four merit-based awards and one need-based award. Awards range between $840 to $1,680 per semester with a sliding scale of academic requirements. Students will need to meet the GPA and curriculum requirements in order to be eligible. Homeschooled students are also eligible to apply. Cost of College in Wyoming: How Does It Stack Up? Tuition and financial aid are two important factors prospective college students should examine when deciding how much a school costs. The charts below provide a good look at the average Wyoming tuition, the average financial aid award and the percentage of students who receive financial aid when enrolling in college. This can help students get a feel for just how much they might expect to see tuition drop when their financial aid reward comes in. As a whole, the cost of college in Wyoming is well below the national average. However, how do Wyoming's colleges stack up against each other in terms of cost? 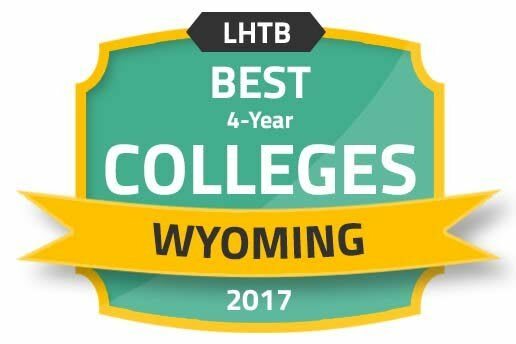 The following rankings list the most affordable colleges in Wyoming by taking each school's tuition cost and subtracting the typical financial aid in order to calculate an overall net price. In order to determine the return on a college investment, prospective students may want to look at their future earning potential. Though the potential income earned by graduates depends on many factors, a few schools tend to produce graduates who make higher wages than others. The following data represents the top two Wyoming colleges with respect to alumni who make the most money ten years after entering college. Another method of calculating the return on a college investment is looking at how much debt graduates carry after college. Student loans can significantly burden a graduate's future professional and personal goals, so it is important to leave college with as little debt as possible. The following list shows the best Wyoming colleges in terms of alumni debt. The final piece in calculating the cost of college in Wyoming is determining the cost of living for the area where a particular school is located. Overall, according to Sperling's Best Places, Wyoming has a cost of living about 4 percent greater than the national average. However, that does not mean that all metro areas of the state are going to be too expensive for students to live comfortably while going to school. This chart details the cost of living in those areas and in the state as a whole. When choosing a Wyoming college, accreditation status is vitally important. Accreditation ensures that a degree or credential comes from a school that has met the standards of a quality education. Employers recognize degrees from accredited institutions, financial aid options might be more abundant for those who attend accredited schools and often times credits from one school will only transfer to another if the transferring institution is accredited. The American Bar Association accredits the law school at University of Wyoming. The Accreditation Commission for Education in Nursing accredits the nursing program at Casper College. According to the City of Cheyenne website, Cheyenne got its roots as a frontier town and now serves as the state capital. With a bustling downtown and busy outdoor scene, residents can partake in everything from a thriving nightlife to rock climbing. While not an average college town, students who attend one of the few post-secondary educational institutions will have plenty to see and enjoy in Cheyenne. LCCC has 3,500 full-time equivalent students and offers a variety of programs, including agribusiness technology, nursing, anthropology, computer science, web design and music. Students can choose from 67 programs that lead to associate degrees and 25 programs that award certificates. This community college provides strong support for organized athletics, including soccer, rodeo and volleyball. Laramie has evolved into a quaint town with strong historical culture. For college students who love the outdoors, Laramie will be a very enjoyable place to study. While Laramie isn't a typical college town, the University of Wyoming and Wyoming Technical Institute are big draws for students from across the state. With a student body of 14,000, the University of Wyoming provides over 190 areas of study, including pharmacy, law, energy resources, business and engineering. Even though the University of Wyoming is a major state institution, class sizes are a reasonable 29 students on average. Students interested in studying abroad will appreciate the fact that the university has the single largest endowment for study abroad support. WyoTech originated in 1966 in a single building. Today, Wyoming Technical Institute has several campuses nationwide, including the flagship in Laramie. WyoTech currently serves as a major vocational training institution for Wyoming students by providing over 300,000 square feet for instructional learning. Courses offered are primarily based in automotive studies and include automotive technology, collision refinishing technology and diesel technology. Attending college is a big step. This list of resources can help students with career development, financial assistance and general college information. This program provides a renewable scholarship to students based on character, financial need and academic merit. Eligible students must come from a mountain west region like Wyoming. The Western Interstate Commission for Higher Education works to improve higher education in western states, including Wyoming. WICHE offers several programs to help Wyoming students attend school outside of Wyoming and vice versa. This commission is an online resource for students that offers information about various Wyoming community colleges, program availability and financial aid support. The mission of the Wyoming DOE is to improve the number of Wyoming students who are ready for college or a professional career. This department is tasked with the development of Wyoming's workforce. Information on various training programs is available here. WTA is a program designed to facilitate the transfer process of associate degree holders from Wyoming community colleges to the University of Wyoming.